Home / National and Metro News / King Cake Baby Creator Suing Movie Producers For Using A Character That Looks Like His! King Cake Baby Creator Suing Movie Producers For Using A Character That Looks Like His! 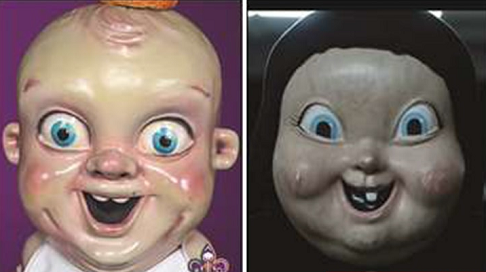 The guy who created that freaky King Cake Baby character, the New Orleans Pelicans mascot claims the movie “Happy Death Day” jacked his freaky face and now he’s suing to get revenge. In his suit, Bertuccelli claims he was shocked when he saw the killer in the movie “Happy Death Day” and the upcoming sequel “Happy Death Day 2U” wore a mask that looked just like his KCB mask. Bertuccelli says NO ONE involved in the movie ever called him up to ask for permission or even credited him and he’s pissed at Universal City Studios, Blumhouse Productions and everyone else attached to the film. Bertuccelli also cites numerous people on social media who pointed out the similarity over the past few months. So, what does he want?? Money. Lots of money. In fact, Bertuccelli believes the movie has made more than $200 MILLION in revenue and he feels entitled to at least 50% of the profits. He also wants a judge to grant an injunction prohibiting the movie producers from using the mask until both sides can work out a deal.